Medium with a Mission to Save Lives. 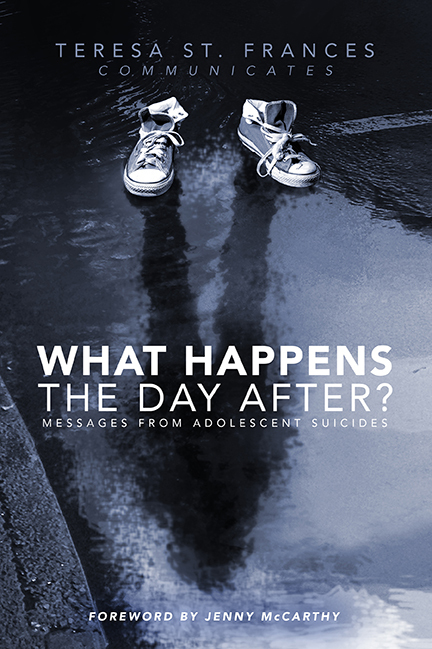 What Happens the Day After: Messages from Adolescent Suicides is an embodiment of messages from teen spirits speaking their truths about the unspoken in a way like no other vehicle. What Happens the Day After tells more than just a tale; it speaks of a universal truth, sadly for hundreds of thousands of teens around the globe. Teen suicide is a silent epidemic which, sadly, is exponentially increasing every year. Through her, the unspoken stories of anger, depression, fear, and anxiety come through with piercing truthfulness. Very powerful and insightful. Read it in a very short time. Made me truly think about how I engage and guide my children in this world where they are bombarded by pressures of living in the social media and the tech era. As a sibling of someone who committed suicide, this book really spoke to me..and gave me a better perspective as a mother of three. Teresa truly has a special gift. Eye Opening, thought provoking, great!!! This book was such an easy read. It literally took me a full day. It took only a day because I could not put it down. Teresa gives great insight. This is definitely a book that should be ready by everyone. I have always wondered what happens when we cross to the other side and I believe Teresa’s writings enlighten all of us. If there were a course for parenthood, this would be the textbook. If there were a course for parenthood, this would be the textbook. Hearing messages directly from youth about what they needed while they were on earth with us is profound–and lifesaving. Teresa St. Frances channels their messages clearly and maintains their dignity. I could not put this book down. Equally interesting, is Teresa’s explanation of how those who have crossed over come through. It reminded me to keep my heart and mind open for their messages. Captivating, powerful, & life changing. Very well written. It’s a quick read that will stay with you long after you’ve read it. Once you start, you won’t want to put it down. The stories and messages are captivating, powerful, and life changing. Highly recommend it for teens, young adults, parents. Very insightful and eye opening. It is a sharing of parents’ all-encompassing pain, their raw and vulnerable questions and answer-seeking from the depths of their heart. However, Teresa’s book does not stop there. As if the writings aren’t enough to take you through to the depths and heart-tugging trenches of human love, pain, and querying, Teresa’s book delivers so much more. During her sessions, Teresa St Frances took her clients beyond knowing to enlightened spiritual heights. Teens who have crossed over perhaps seek her out because they intuitively know their messages will be delivered with the utmost of humility and tender-loving care. The book is a stronghold for change with its deep answer-seeking questioning, affording loved ones left behind some clue as to their universal question of “why.” It provides insights from the teens themselves as Teresa gently, humbly, and energetically extracts the answers so many families seek. Teresa will use the book as a foundation for reframing the mindset of those she speaks to in order to not only enlighten her listeners but to educate and inform them as well. Her driving passion to be the vessel which delivers these teens’ message is what fills the pages of this book. Throughout the pages, you will find thought-provoking introspection that will leave you seeking to take inspired action by the reality of these stories. Teresa is not only gifted, but spirited as well in her calling, purpose, and passion to spread the message and save a life. 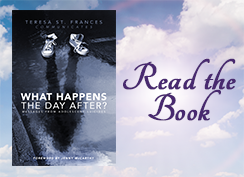 Teresa St. Frances has honored the teens, their loved ones, and her calling by filling the pages of this book with their stories, their messages, and her mission. Teresa St. Frances is an author, psychic medium, life coach, animal communicator and lecturer. She lives with her fur “kids” in Elmwood Park, NJ where she gives private readings and workshops.